Admire the view and tuck a bench beneath the draping branches of an aromatic cedar. Cluster a pair of adirondack chairs next to your favorite planting. Rest your paper on the handy side table. Drink in the beauty of your garden. Arboria let's you rest easy and leave the fast pace of daily living behind. Pull up a chair or share a bench with a friend. Whether you choose a single piece, or full ensemble, it's likely you'll stay awhile. Once you let yourself go, you can fall into a comfortable curved back chair, drape your arms over the broad armrests and enjoy the look of the finely crafted table. With Arboria you can let any occasion be cause for celebration. Delight in the simple elegance and versatility. Dine with family and friends or enjoy and intimate moment with your loved one. Arboria Hardwood Furniture is perfect for any gathering. Arboria products are designed and manufactured by LWO Corporation of Portland, Oregon. 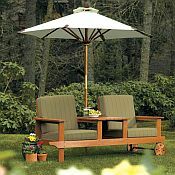 Since 1980, LWO Corporation has developed a nationwide reputation as a designer and manufacturer of innovative, high-quality wood products for the home and garden. Arboria is extremely proud of having gained chain of custody certification by the Forest Stewardship Council® for the wood used in their furniture items. FSC® certification is the mark of credibility and assurance that reflects commitment to the environment. For years Arboria has been proud to offer the best value in natural hardwood furniture and has built their reputation on combining value and integrity in everything they do. At the core of every Arboria product is the wood. When grown and sourced correctly, wood is one of the most sustainable materials available. Wood absorbs more greenhouse gases prior to being harvested than are released as a result of the manufacture of our products. Making wood one of the few carbon negative materials. This is a fact that has always been true, even when green wasn´t much more than a color. In addition to the beauty, dependability and environmental benefits of wood, Arboria is proud to offer an entire collection that contributes towards responsible management of the world´s forests. Ultimately, Arboria´s goal is to provide peace-of-mind to their customers, and enhance the trust that comes with the purchase of every piece of Arboria furniture.